The Bazaruto Archipelago comprises of five islands which are within the Bazaruto Archipelago. From north to south, these islands are Bazaruto, Santa Carolina Known as Paradise Island, Benguerra, Margaruque and Bangue. There are a number of diving sites around the islands, generally on the seaward side. Other dive sites are located on the seaward side of San Sebastian (south of the islands on the mainland peninsular ), A point jutting out in line with the islands. From San Sebastian, the mainland curves south-west to form a large bay which is protected from rough seas by the point and the islands. Travelling northwards up the bay, Archipelago Resort looks out to the south of Margaruque Island. Below are a few of the regular dive sites. There are many others, but the distance to these reefs is greater and guests only dive there on special request. This reef is situated on the north-west side of the picturesque island, Margaruque. At low tide the top of the reef is out of water and drops off in a wall to a sandy channel at 10m. Due to its accessibility, it is a popular snorkel site as well as a dive site. The wall is teaming with a huge variety of fish life – large parrot fish, sea goodies, trumpet fish, devil fire fish, butterfly fish and angelfish, to name a few. There are dense shoals of Natal Moonies which form a solid curtain of life and then parts to allow you through and closes up behind you. Octopus hide in the rock crevasse and crayfish feelers can be seen protruding from under ledges. Well camouflaged scorpion fish lie on the wall and can be spotted by the sharp-eyed diver. The base of the wall shelters several types of small rays, lying flat on the sand and shoals of stump nose. There is the possibility of seeing a dolphin or two as they cruise along the channel, close to the island and then, whilst looking towards the channel, there is a sharp rush of adrenalin as there suddenly appears a group of 6 huge brindle bass, about 1,5m in length and 200kg! At slack tide, or half way between high or low tide, Margaruque is an easy, relaxing dive – good for Open Water Divers and dive students. However, for the more experienced divers, they can have an exciting high speed drift dive at the change of tides on the “Margaruque Express”. Two Mile is a barrier reef protecting a narrow channel between the high sand dunes on the south of Bazaruto Island and the long, white beaches of the north point of Benguerra Island. The north tip of the reef is mid-way between the islands and runs southwards, parallel to Benguerra Island, approximately 4.5 kilometres east of its shore. The top of the reef protrudes from the sea at low tide, and slopes gently towards the east. 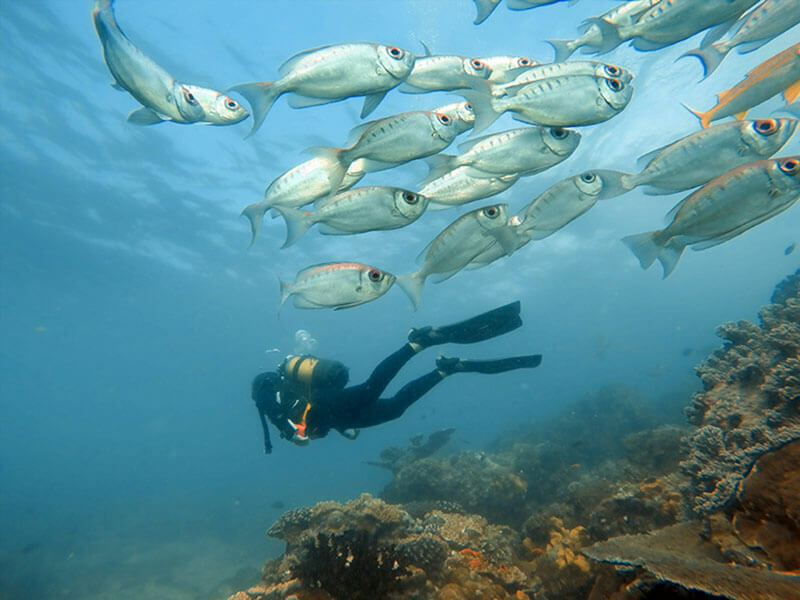 It is well known for its excellent snorkelling sites inside the reef such as the Aquarium, as well as for a host of exciting dives on the seaward side. These dives sites have alluring names such as The Arches, Shark Point, North Point, The Boulders, Surgeon Rock, The Drop-off, Cathedral and The Gap. The flat-topped reef is carved with exciting gullies, which curve out from the shallows towards the deeper areas and each bend in the gully gives the divers a feeling of anticipation of what’s around the corner. The reef has a colourful diversity of hard and soft corals, anemone fish hide in their swaying homes and there are numerous schools of brightly coloured reef fish such as coachman, fusilier, snapper and surgeon. Schools of large pelagic and reef fish also frequent the area and you may encounter potato bass; kingfish; barracuda; guitar fish; devil, manta and honeycomb rays. Large moray eels lurk in their rocky hideouts and black tip reef sharks often put in an appearance. 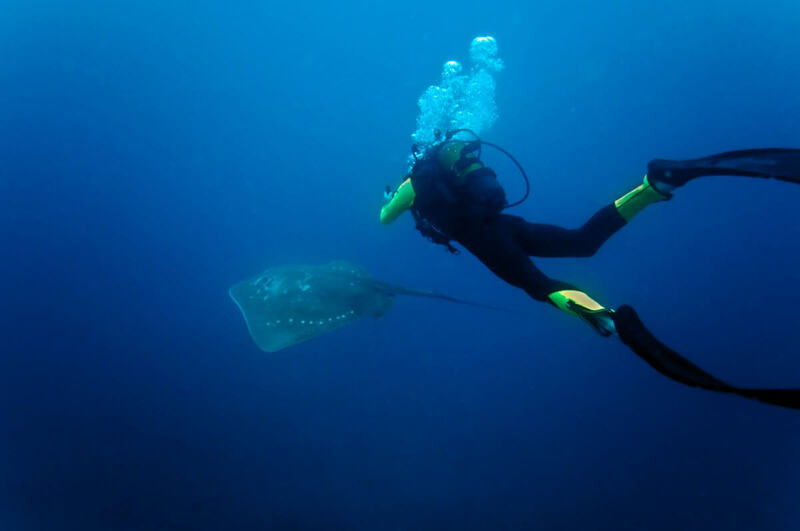 The wonderful whale sharks and numerous turtles are a welcome site to all divers. Shy dugong are in the area and are sometimes seen from the boat, but count yourself extremely lucky to see one whilst diving. 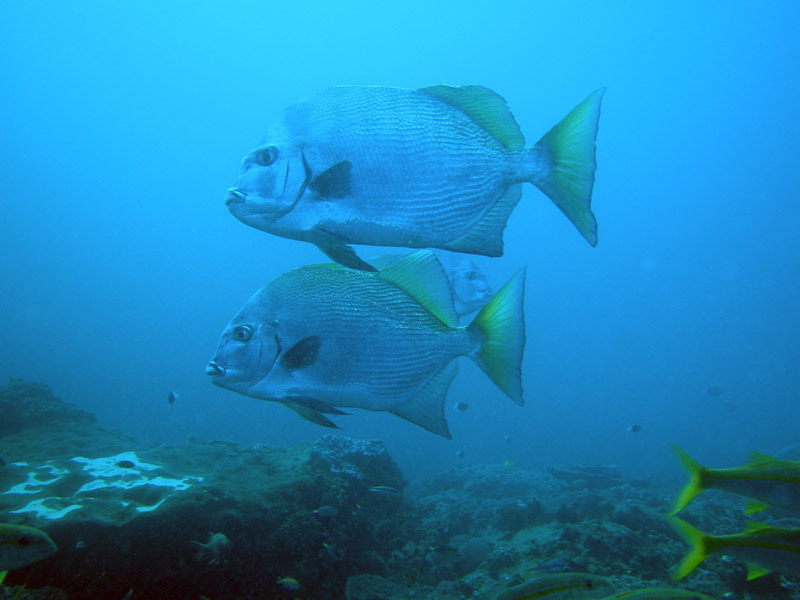 Two Mile is an excellent dive site for all levels of divers. Baluba Reef is situated straight out from Dive Bazaruto’s launch site, past the line of surf between Margaruque Island and San Sebastian point. It is a large, relatively level, flat topped reef with some lovely caves and gullies. Whilst gliding above the reef, shoals of redfang triggerfish entertain divers by hiding their heads in cracks – leaving their entire bodies exposed. Clown triggerfish are plentiful and look as though an artist has been painting their bodies. Numerous brightly coloured reef fish give the reef a busy appearance and looking down there are sandy pits, much like sink holes. Here there are honey comb morays curled into crevices looking to prey on unsuspecting octopus, which are abundant on this reef. Dropping into the gullies, divers follow winding paths through coral gardens where caves demand to be explored and swim throughs are irresistible. For nudibranch lovers, this is the ultimate dive, with an amazing variety of these small, dainty reef dwellers. 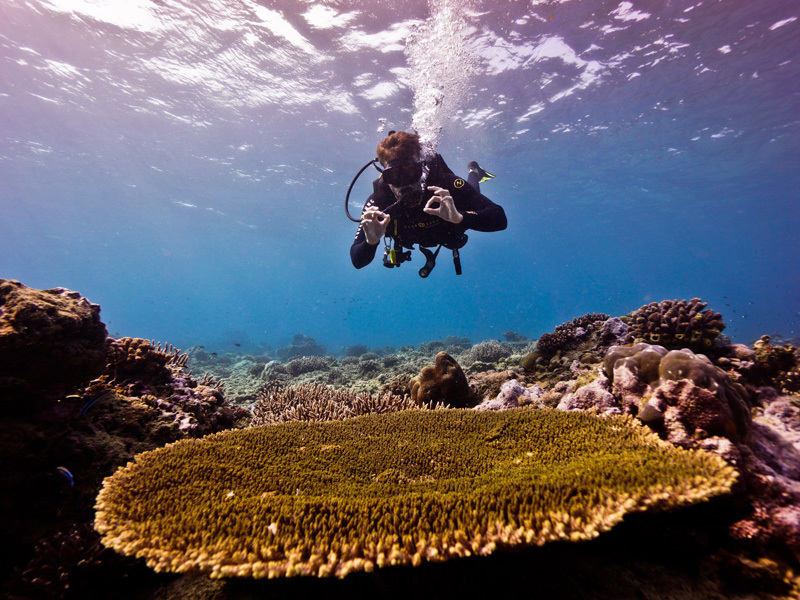 Baluba is perfect for Open Water Divers and is an awesome site for underwater photography. Linene Reef lies east of San Sebastian point and north east of Linene Island. Here is where great shoals of pelagic fish merge with reef dwellers and divers are often met by a number of potato bass. The reef forms a ridge at 16m, running north west to south east, upon which the coral formations look like fairy castles inhabited by magically coloured wrasse, sea goldies, boxies, anglefish and so much more. South of the ridge the reef slopes down and then drops off in a low wall to “The Caves” at 22m. This site looks like a mini-rift valley with its walled sides, which are undercut and harbour various species of large rockcod. Every type of reef fish seems to exist here, larger and more numerous than on most other reefs. There is a trench which has coral knitted over the top and looking down the openings there are enormous morays hidden in the depths. Swimming eastwards, the valley flattens out and majestic manta rays often glide past. North of the ridge, the reef drops off dramatically into a deep channel where shoals of barracuda, sierra and kingfish hunt. This is also the feeding ground for reef shark and hammerheads. Linene is an exciting dive, suitable for Advanced Divers. Marlin Pinnacle is a like small treasure island rising up from the sandy sea bottom at 37m to a depth of 30m. Divers are almost guaranteed huge potato bass and shoals of large pelagic fish, as well as large manta rays and devil rays. 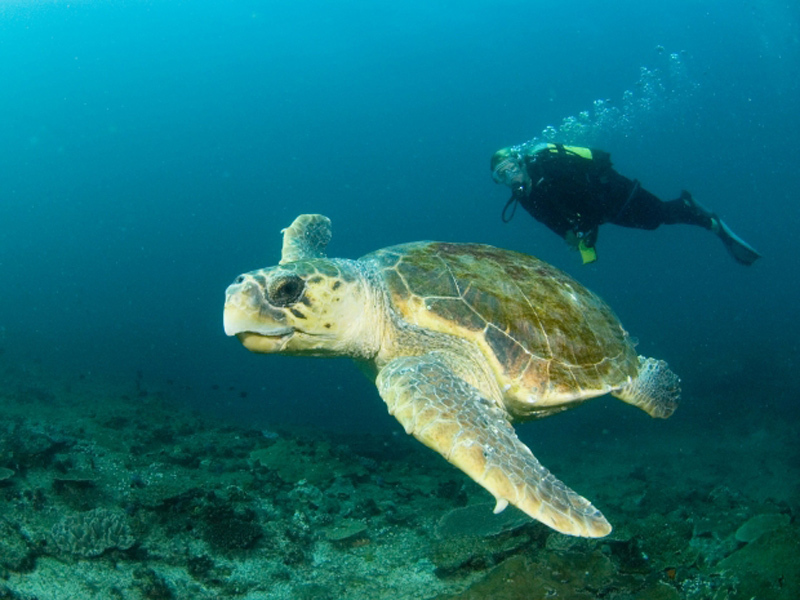 Great big turtles circle the divers, checking them out before slowly swimming away to find a secluded resting spot. This is a top fishing site as game fish such as marlin and sailfish are abundant. Shark sightings are numerous and include reef shark, hammerheads, Zambezi and tigers. During the whale season, humpbacks are often seen at the surface and their haunting calls are heard underwater. Whale sharks are also frequent visitors.